in this fascinating and eye-opening revolution-era novel, octavian, a black youth raised in a boston household of radical philosophers, is given an excellent classic education. he and his mother, an african princess, are kept isolated on the estate, and only as he grows does he realize that whole he is well dressed and well fed, he is indeed a captive being used by his guardians as part of an experiment to determine the intellectual acuity of africans. as the fortunes of the novanglian college of lucidity change, so do the nature and conduct of their experiments. the boy's guardians host a pox party where everyone is inoculated with the disease in hopes that they will be immune to its effects, but, instead, octavian's mother dies. he runs away and ends up playing the fiddle and joining the patriot's cause. he's eventually captured and brought back to his household where he's bound and forced to wear an iron mask until one of his more sympathetic instructors engineers his escape. 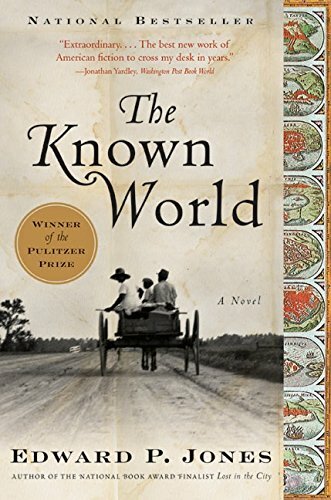 set in manchester county, virginia, twenty years before the civil war began, the known world is a masterpiece of overlapping plot lines, time shifts, and heartbreaking details of life under slavery. caldonia townsend is an educated black slaveowner, the widow of a well-loved you farmer named henry, whose parents had bought their own freedom, and then freed their son, only to watch him himself a slave as soon as he had saved enough money. although a fair and gentle master by the standards of the day, henry townsend had learned from his former master about the proper distance to keep from one's property. after his death, his slaves wonder if caldonia will free them. when she fails to do so, but instead breaches the code that keeps them separate from her, a little piece of manchester county begins to unravel. you both have something in common: i didn't finish your novels. i did not finish you critically acclaimed, award-winning novels. and i am disappointed in you for that. you both have such a great premise for a story. i wanted to love your works. instead, i was bored, horrified, and felt incredibly stupid for my lack of interest. m. t., your narrator is so dense and so obtuse that i wanted no part of him. octavian can keep his intelligence, and pretension, for another reader. also, did you need to make this two volumes? i highly doubt it. i am boggled as to how you won any awards and earned so many starred reviews. edward, your story was so all over the place, i needed a map. i'd start warming up to a character and then suddenly, i was in another person's life at a completely different point in time. and i had no idea why you were working around your story in this way. why couldn't it be a bit more linear and plot driven, instead of a plot hidden in flowery narration and an abundant cast of characters? i am not pleased with the pulitzer prize committee for picking you. sadly, i will not likely pick up anything by either of you again. although, it might not be you. it might be me.